After last touring South Africa in 1998, the famous U2 will be stopping over in Johannesburg and Cape Town as part of their 360° tour in February 2011 - and this time, we have tickets! 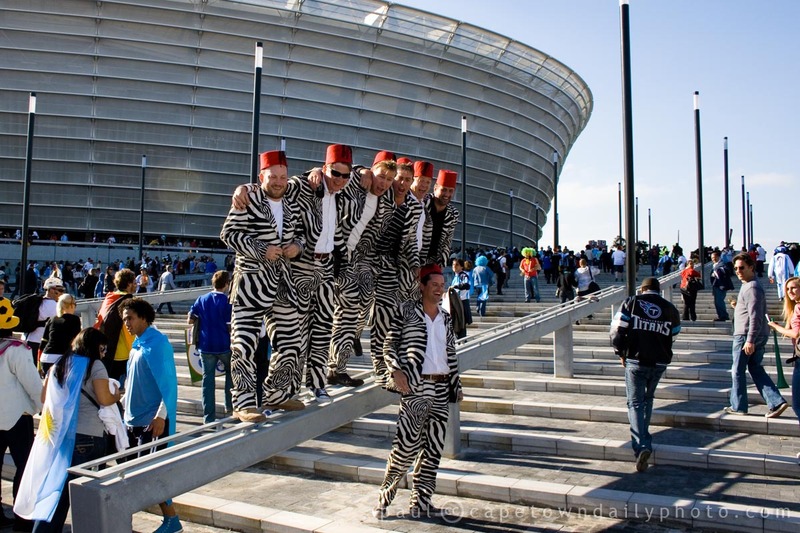 I took this photo of these strange zebra-men at the Cape Town Stadium a while ago (during the Football World Cup), and share it with you today because this, dear friends, is the place where 72,000 fans will arrive to watch the spectacle that U2 is so well known for. Kerry-Anne and I hate queuing for tickets (it's far too boring! ), so we normally take our chances with purchasing from an online ticket booking site, Computicket. I say "take our chances" because South African sites, and I guess this one specifically, are known not to handle well huge volumes of people trying to buy tickets at once, and invariably slow to the pace of a reluctant teenager on a family hike - leading many close to death from pure frustration. Posted in Events and tagged greenpoint, music, stadium on Friday, 22 October, 2010 by Paul.